Investigating murder scenes, interrogating bad guys and solving crimes in less than 60 minutes – “CSI: Crime Scene Investigation” could make anyone jump off the couch into forensic science. 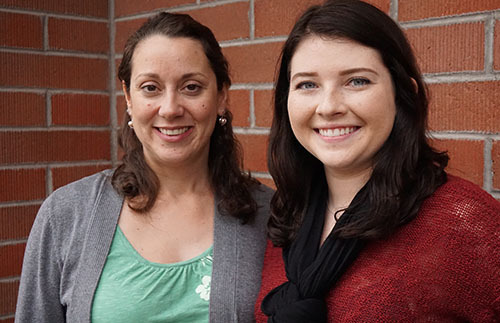 And it’s what one faculty member and one student at Grand Canyon University found they had in common when they were paired as a mentor and mentee in the Honors College’s first Personal Academic Boot Camp. Melissa Beddow (left) mentored Abbie Perzan during a six-week boot camp. Abbie Perzan, a freshman studying forensic science, recently was awarded a $3,000 scholarship from the Honors College after participating in its six-week camp, which partnered students with field experts and mentors. The camp required students to dedicate personal time in workshops, conduct career research and meet one-on-one with professionals in their respective fields of study. Now, after taking plunge into the real-world of forensic science, Perzan has gained further momentum to pursue a career as a forensic scientist. She credits Melissa Beddow, an assistant professor of forensic science in GCU’s College of Science, Engineering and Technology, for helping pave the way. Liking what she saw on television at a young age, Perzan took biology classes in high school and decided forensic science was for her. At that time, Beddow already had completed her undergraduate studies in biology from the University of California, Santa Cruz, and had figured out she had developed fairly good logical and analytical skills to predict many of the catastrophic cases on CSI. Beddow worked for more than seven years in various laboratories, gaining experience in human diagnostic testing and biotechnology, before arriving at GCU in 2011. She also has testified as a DNA analysis expert in several criminal trials. Beddow, who clearly knows her stuff, said she was certain Perzan would win the Honors College boot camp award because of her strong dedication and genuine interest in the field. Perzan also made a good impression at the Phoenix Police Department Laboratory Services Bureau and the Maricopa County Sheriff’s Office Crime Laboratory. There, she made more than two dozen new contacts that she plans on using in the near future when searching for internship opportunities or applying for jobs. Through the boot camp, Perzan also observed a court case and watched scientists take fingerprints from a dead body. She said the experience opened her eyes to a whole new world beyond television and technology. “TV and Google were pretty much my sources for information before all of this, but I learned that you can’t Google everything, and real life is so much different from TV,” Perzan said. For example, court cases take longer in real life than on TV, and forensic experts are allowed only minimal explanations in court or they may be sanctioned for unnecessary details, she said. Perzan also was exposed to what most people would consider the unpleasant task of fingerprinting a deceased person. Occasionally, all that is needed is an ink pad and a print card, but Perzan got a big surprise when she saw frozen severed hands that had been removed from a body after the fingerprinted cards would not transfer properly. “It was probably my most favorite part of this experience because as a freshman I still haven’t gotten to the crime case courses yet and this reconfirmed that this is what I want to do. This is definitely my weird interest,” Perzan said. As a high school student, Perzan struggled personally before finding at GCU the support she needed to get out of her shell. But with continued guidance from Beddow, Perzan is looking for further shadowing and mentoring opportunities, including a tour of a medical autopsy lab in Maricopa County. Antoinette Farmer, vice president of institutional effectiveness, said that while GCU has a lot of “smart, brilliant, high potential students,” Perzan’s initiative, hard work and diligence were evident when she was interviewed for the scholarship. Perzan said boot camp could not have come at a better time.